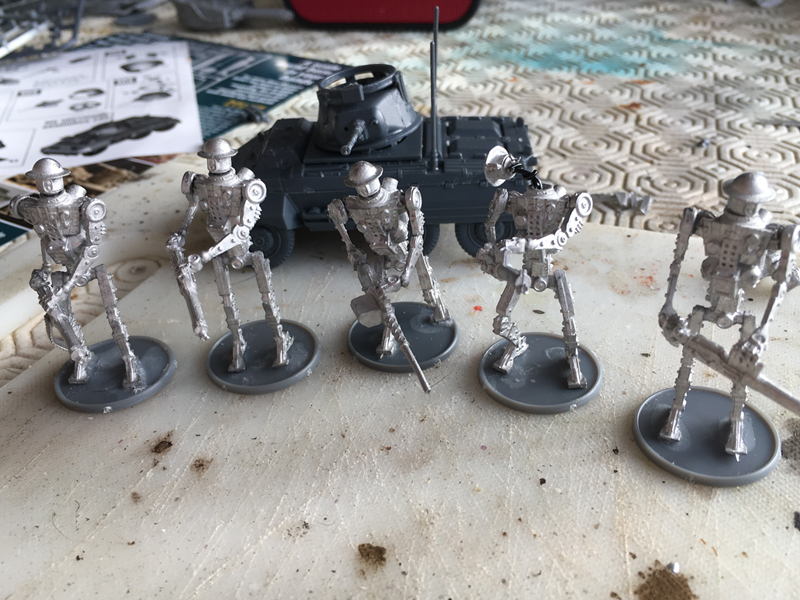 When I first saw the automatons, I thought it would be quite easy to build, but oh how I was wrong! There were so many bits. 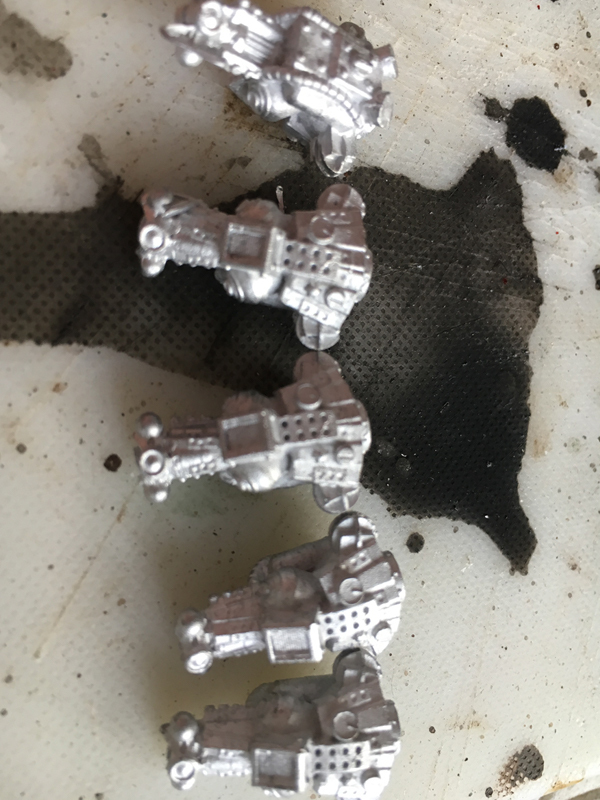 There are 5 bodies with ball joints for arms and legs. Then there a 5 automated heads. 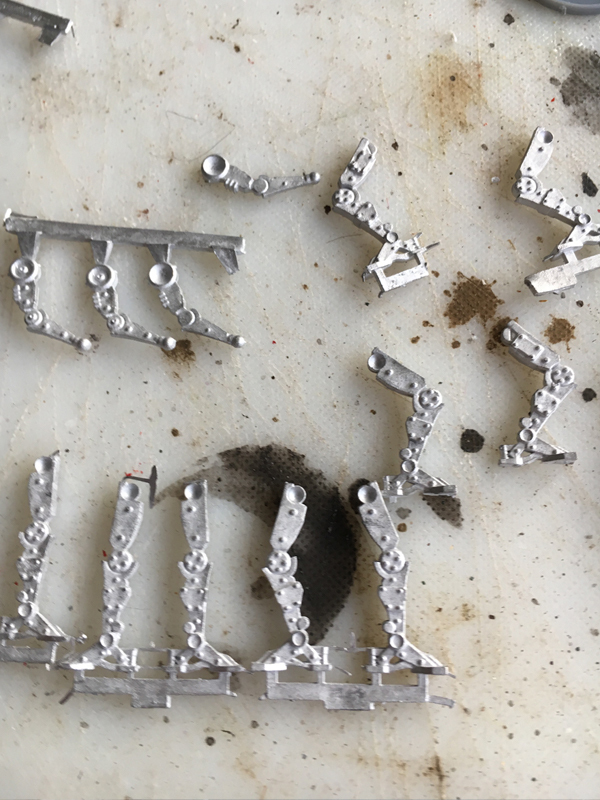 After that there are over ten arms and ten legs all on sprues. But here’s the twist! They are all metal! And so fiddly that every 5 minutes an arm, head or leg snaps off. But finally -after a lot of frustration- they were complete! Yet I had another crazy (but doable) Stefan idea! I found some wire and ,with a bit of drilling, I had a body falling backwards, his head hanging on by a wire! 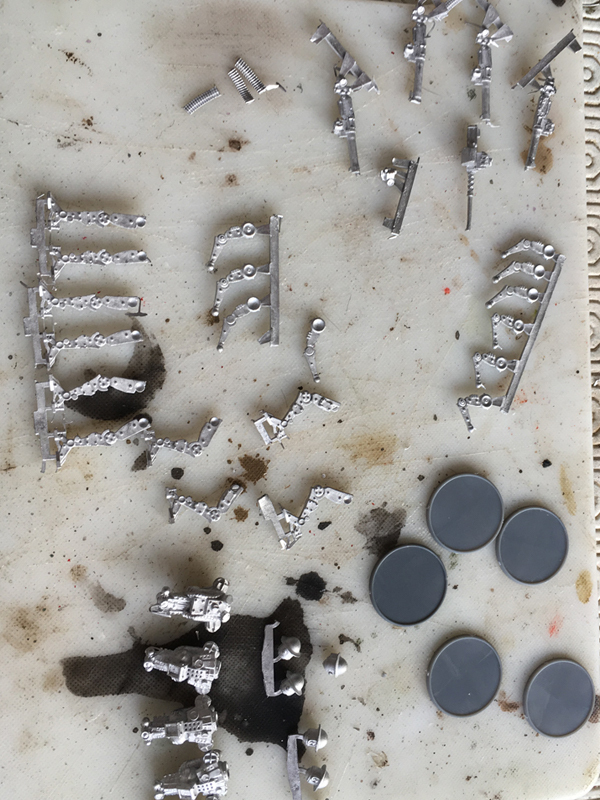 I couldn’t wait to see them In game but, unfortunately they didn’t do much they did get a few kills until they got hit by a friendly artillery strike from my own artillery observer in their FIRST GAME, man was it annoying to see them wiped off the board so quickly. Simon: Stefan got really unlucky with his artillery strike, he rolled a 1 which allowed me to move the strike over his own troops and then I rolled a six to get a direct hit on his automatons. They had one round of shooting before this happened and at long range, deleted an 11 man squad of Russians. They’re not to be underestimated! This inexperienced squad of Russians got caught in the open. It didn’t end well for them. In Game. I think the automatons hit the rule of cool pretty hard. (They look cool, so they’re going in the list!) 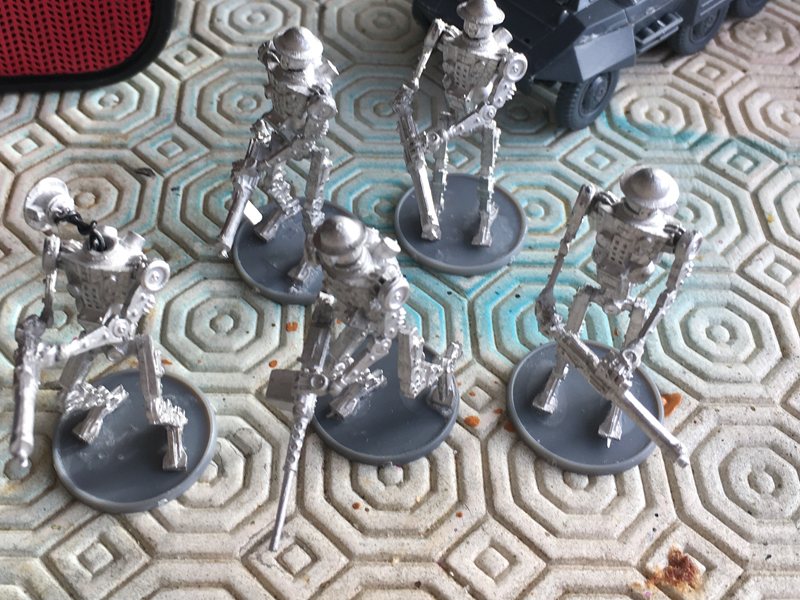 I personally think that they should be like Totenkorps and ignore pins, the lack of reactions coupled with slow / testing every time they get an order is enough of a hinderance to them already. A full squad will set you back 150 points, 170 with an HMG. I’m not sure whether the HMG is actually worth having or not. 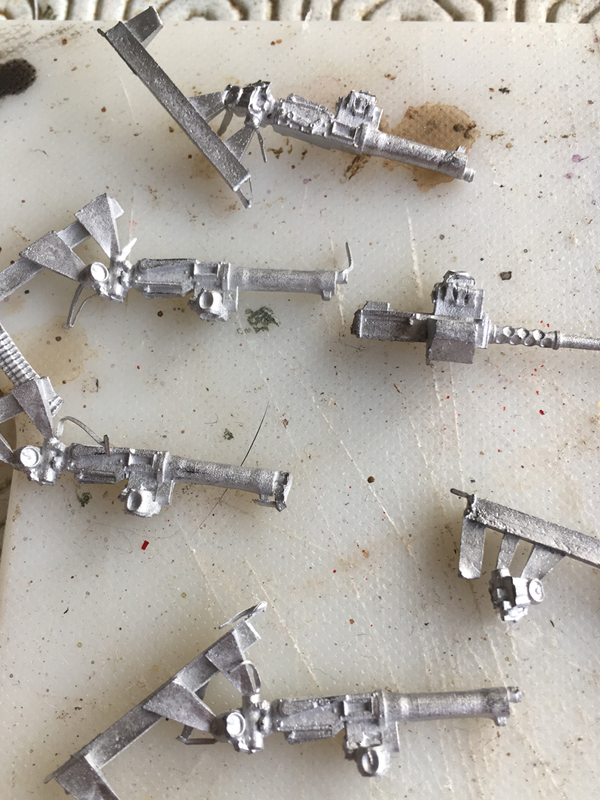 At times I think the +1 pen and ability to pin 7+ closed top vehicles is good, others I think I’d rather just have 5 MMGs firing at soft targets and making the big scary beasties watch out. They were the reason I nearly went British ( that and a free Forward Artillery Observer) luckily I decided against the idea as I thought the British were too defensive for me. I really wouldn’t have coped with the models at all and would probably have ended up using Star Wars droids. The do make a very powerful long range fire base and if used in twos are very difficult to hit! Using them in twos! I’d never seen that. I’ll make the suggestion to Stefan. And more order dice for your figures! not to mention they get the small team defensive bonus.